From THE BIG STORY: "Mike Perkins has spent countless hours filming Jacksonville Jaguars practices from a scissor lift about 50 feet in the air. It was uncomfortable, even downright scary, at times. Strong wind, sideways rain, nearby lightning, Perkins has experienced all of it. So when Perkins, the team's director of football technology, had the opportunity to move away from the sometimes-dangerous lifts for good, he didn't hesitate. 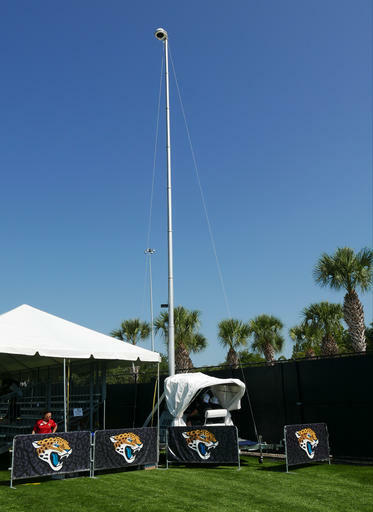 A company called 8K Solutions in Titusville, about two hours south of Jacksonville, has seemingly perfected the mast cams (mastRcam). The Jaguars used them at the Senior Bowl in January, where a number of other NFL teams took notice." Click Here to Read the Full Article on THE BIG STORY.